Download the game WordFeud for your iPhone for free here on the page. WordFeud is a game that is popular among many - young as well as older. In other words, it is a game for the whole family. Why do not you download WordFeud at all? As the range of apps for smartphones is getting bigger, at first glance it may be a bit difficult to evaluate which apps will best suit you. WordFeud is an example of an app that has made great enthusiasm among many, but why? What is special about WordFeud? On many points WordFeud reminds of the popular board game, Scrabble. Scrabble has helped to create a framework for many playthings at home with family and friends, but WordFeud makes it possible to play with your closest, even if you're not in the same place. In short, in WordFeud, you must be mad at others in who can fill the game board with the words that give many points. It's smart with an app like WordFeud, that you can play right when you want and wherever you want. WordFeud is an app designed for different operating systems. The strategic game is compatible with both iOS devices and Android. 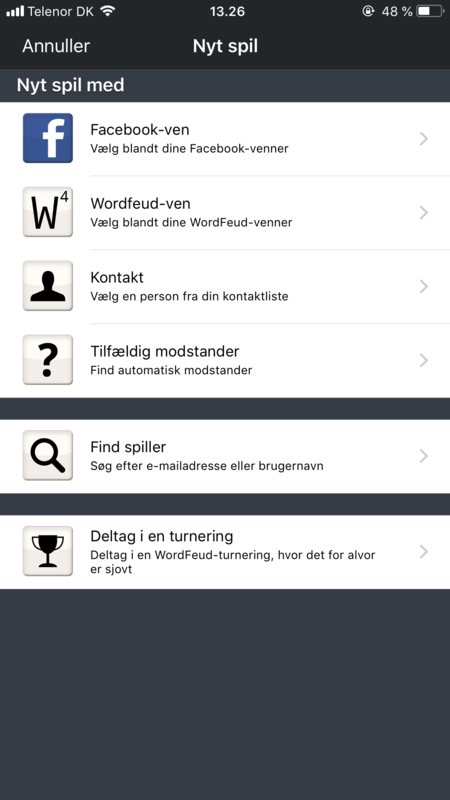 Via this page you can download WordFeud if you own an iPhone, iPad or iPod Touch. If you own a smartphone with an Android operating system, you can download WordFeud on Google Play. You can find more information about WordFeud on the manufacturer's official website via the link. Download of WordFeud runs smoothly. It's an app that does not take much of the storage space on your smartphone, so it does not take more than a few minutes before the game is ready for use on your mobile device. The only WordFeud requires is that you create as a user inside the app. There are two ways you can create yourself as a user, as you can see below. You can either choose to log in to WordFeud via your Facebook account or quickly sign up via your email address. 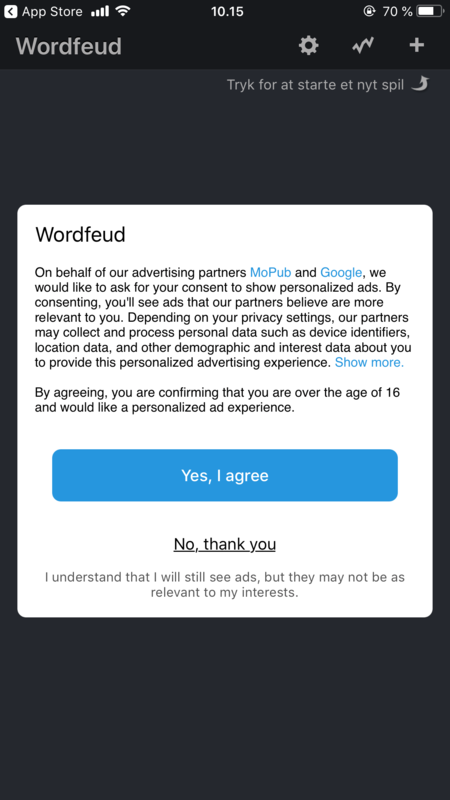 When you log in as a user for the first time through your iPhone, you will be asked if you want to receive messages and / or push messages from WordFeud. Once you have chosen this on or off, it has become time for you to get to know the game. The rules of WordFeud are simple, and although you may not have come to know a game that is in the same genre, you will quickly learn how WordFeud works. The first thing to do is start a new game. This requires that you choose what kind of opponent you want to challenge. Here are more choices. You can of course choose to play against friends and family that you have on your personal contact list. 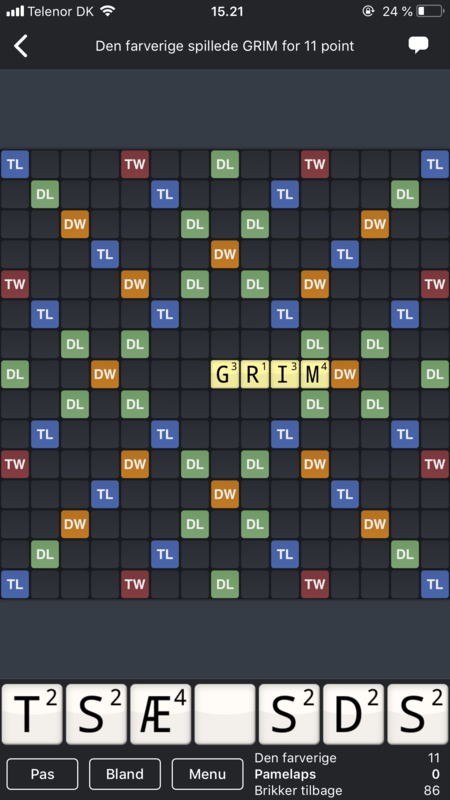 You also have the opportunity to play against a random opponent that WordFeud chooses for you. Additionally, you can add your opponents like WordFeud friends inside the app so you can quickly find them when you want to play. If you have the courage of a small challenge, there is also the opportunity to participate in WordFeud tournaments. Games are typically funniest when you know the rules. In WordFeud it's important that you get to know the game board well. In each game you will be given a variety of different letters, each counting for a certain number of points. It is, therefore, about forming words that give as many points as you can to win over your opponent. In WordFeud, you should think strategically and evaluate each word which gives you the highest possible points. For example, on the game board you will find some bonus fields marked with different letters and colors. If you get it, it's a good idea to use the bonus fields to your advantage as these give you extra points in the game. If you find it difficult to form a brand new word based on the letters you have been made available, it may often be worthwhile to keep an eye on what words your opponent has formed - m &aring; be sure to build on these words by adding another ending. This is a fifth that can help you get a step closer to the victory. Are you interested in exchanging fifs and possible words with your opponent, you can use the chat feature in WordFeud. This is located in the top right corner of the screen. If you are interested in following your development in the game, WordFeud allows you to track your player stats inside the app. Here you can create an overview of how you overall manage your games. This feature shows you the number of won, lost and unsuccessful matches. Often it may be relevant to contact the developer behind a particular program. This may be in situations where you have a problem or an unresolved question about the program's features. 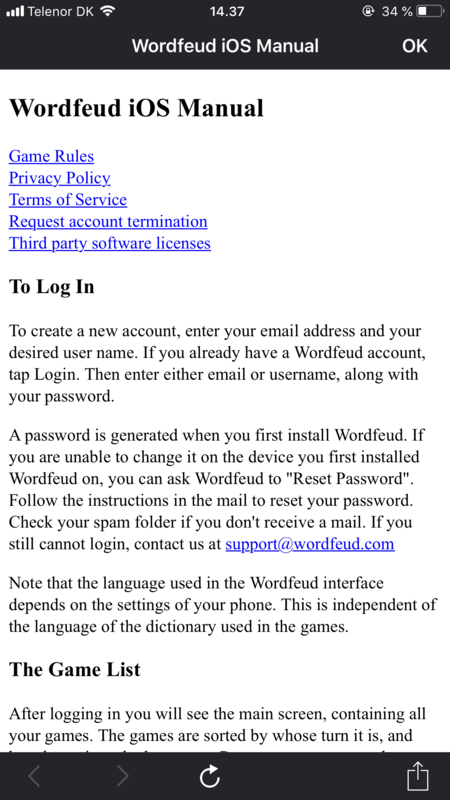 On the manufacturer's official website you will find an email address that you can contact if you have questions about WordFeud. Before contacting the manufacturer via email, it may be a good idea to check if there is no answer to your question yet. 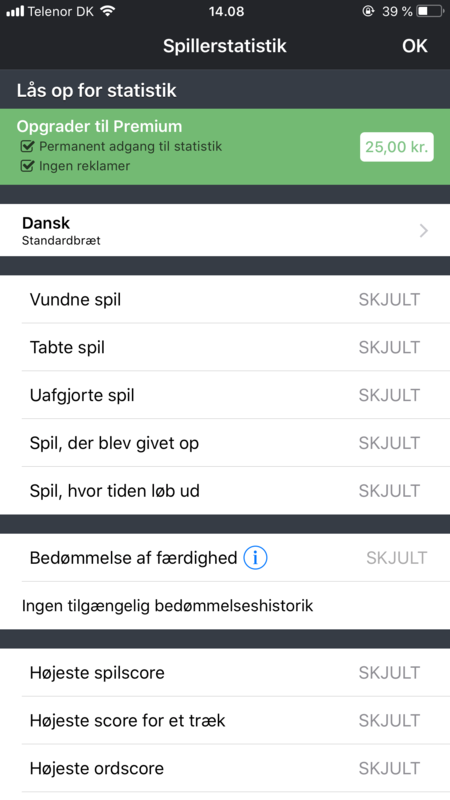 Inside the WordFeud app, you will find an English Help Manual, which includes reviewing the game's main features and rules. If you are often in search of new apps for your iPhone, we strongly encourage you to visit our iPhone category where we've collected reviews of a number of popular apps. It may be nice to have some different games that you can vary between why we can also recommend you to try the game Subway Surfers. Here, there is more focus on fast decisions, unlike WordFeud, where strategic thinking is in focus. If you are interested in downloading an app that can make the boring everyday evenings a bit more fun, WordFeud is likely to be a game that will fall into your taste. The actual download process of the game is fast and you just need to create yourself as a user to enjoy the game. You have the opportunity to challenge your family and your friends, but also random opponents who have a WordFeud user. The app is also very user-friendly, which is reflected in the simple design. WordFeud addresses both the beginner, but also the more advanced user. All in all, we highly recommend you to try WordFeud. Find WordFeud , mark it and choose "Uninstall"
Should WordFeud has been damaged or corrupted and thereby difficult to remove we can recommend you finding help to uninstall it here.